What’s a pirate without her crew? Abandoned on an island and left for dead, pirate Grace Porter has no idea how she’ll save the crew of the Lady Luck from the traitors in their midst... until an unexpected ally appears, bringing new hope with them. 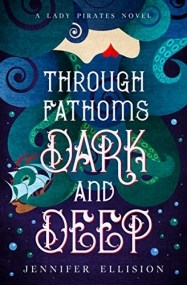 But Grace hadn't counted on the fact her new alliance means she'll be forced to confront her past--not to mention, her strange connection to the sea monsters who stole her mother. A connection that's only growing stronger. Now, armed only with her wits and the stolen scrap of a magical map, Grace races off in hot pursuit of her ship, desperate to reach the Lady Luck before her enemies can rain destruction and havoc upon them. Grace prays she finds them first, but the clock is ticking. And she may already be too late. The second fantasy novel in this YA pirates adventure series will continue to enthrall fans of Daughter of the Pirate King, Seafire, and To Kill a Kingdom. After being marooned on a deserted island with Leo and Sam, Grace knows they need to find a way to get back to the ship Lady Luck. There's a traitor aboard it. But it's hard for Grace to focus on the task at hand when the Mordgris haunt her even on land. Grace can't help but feel she's going crazy. When they signal a passing ship, Grace is surprised and uncertain when she discovers it's her father's. Grace still holds so much anger for him and doesn't want to forgive him for abandoning her, but he's probably the only one who can get her back to Lady Luck. The omna map becomes her tool of persuasion and her father finally relents. However, there's still a lot Grace doesn't understand about the Mordgris, but many secrets hid within the depths of the ocean and Grace might not like what she discovers. I have to say that I liked this one even more than the first! I really like how Grace's father came into the picture and we are able to learn a little more about who he is. I also like watching the bond between Leo and Grace grow and that there's more of a connection in this book. Lastly, Sam. She has to be my favorite character because of the comedy she brings in. She's very entertaining. Final Verdict: I would recommend this to fans of pirates, sailing, adventure, supernatural creatures, sisterhood, and romance. I can't wait for the third!